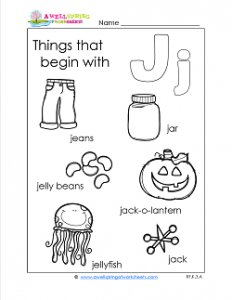 Here are some neat things that start with j – jar, jack, jack-lantern, jeans, jelly beans, and jellyfish. These are all pictured on this worksheet representing the letter j. See if your kids can tell you what the pictures are before reading the page to them. Have them sound out the letter j something like this: /j/ /j/ jeans, /j/ /j/ jar. Then you can have them read the picture words to you. Next step, have them circle the beginning j in each word. Last but not least, color away!